A memorial honoring the Montford Point Marines broke ground last week in Jacksonville. We honor the legacy of the Montford Point Marines and hear a firsthand account of 92 year old Montford Pointer Norman Preston. Last week, a groundbreaking ceremony took place in Jacksonville for the National Montford Point Marines Memorial. They were the first African Americans to join the United States Marine Corp, overcoming discrimination and segregation for an opportunity to serve during World War II. Today, we explore the legacy of the Montford Point Marines and hear a firsthand account of Wilmington resident Norman Preston. A World War II veteran, 92 year old Preston is among an elite few, our nation’s first black Marines. He was a private in his mid-20’s when he arrived at Montford Point in Jacksonville, North Carolina, a segregated training camp for African American Marines. Prior to 1941, African Americans were not allowed to enlist in the military. But as U.S. involvement in World War II became a possibility, there was a sudden need for jobs in the defense industry. National Monument Director of the Montford Point Marine Museum Houston Shinal says President Roosevelt issued a directive on June 25th, 1941 that that sought to put an end to discrimination in the Armed Forces. Roosevelt’s executive order was the first Presidential decree issued on race since Reconstruction. The directive required the armed services to begin recruiting and enlisting African Americans. In 1942, the first black Marines were sent to Camp Montford Point in Jacksonville. Shinal says they were trained separately and away from their white counterparts. While white Marines were sent to traditional boot camps including Parris Island and Camp Lejeune, Montford Point was exclusively for African Americans. Shinal says many of the black Marines didn’t know they were heading to a segregated training facility. During the early years of Montford Point, white drill instructors were in charge of training young recruits. By 1945, all of the drill instructors at Montford Point were replaced with African American instructors that Shinal says were tougher and pushed them harder. 92 year old Norman Preston remembers the intense training. He says his African American drill instructor pushed him to his limits because he understood what they had to go through. While at Montford Point, Preston, who was a military police officer says railroad tracks divided white residents from the camp for African-American troops. He remembers he was forbidden to enter the main base of Camp Lejeune unless accompanied by a white Marine. 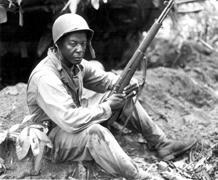 The intense training at Montford Point prepared the African American marines for combat, where they were often involved in support roles such as supplying ammunitions to the frontlines. Shinal says the attitude toward African American Marines on the battlefield was much different than in non-combat situations. Between 1942 and 1949 when Camp Montford Point was deactivated, more than 20,000 African American Marines had been trained at the Jacksonville facility. Many of these men went on to further serve their communities. In 1974, Camp Montford Point was renamed Camp Johnson to honor Sgt. Maj. Gilbert "Hashmark" Johnson who one of the first African Americans to enlist and serve as a drill instructor in the Marine Corps. Now, Camp Johnson is home to the National Montford Point Museum. Currently, the 9mm anti-aircraft gun is on display at the museum, but will be relocated to the Montford Point Memorial that’s being constructed at Camp Johnson’s front gate. Shinal says the memorial will be built at Lejeune Memorial Gardens on NC 24. A centerpiece of the memorial will be the large statue by artist and sculptor Stan Watts, who created the 40 foot tall bronze monument named “To Lift A Nation” honoring those who died during the terrorists attacks on September 11th. The project became active in 2009 and the memorial is being paid for by donations. Shinal says phase one of the project is estimated at $681,000 and will be complete in August. Phase two comes in at just over a million dollars, and includes the placement of memorial stones. Shinal says an additional $900,000 still needs to be raised before initiating phase two. While the monument is just starting its long journey to completion, the National Montford Point Museum is open to the public. It’s located in the East Wing of building M101 aboard Marine Corps Base Camp Johnson. Hours are from 11 to 2, and 4 to 7:00 pm Tuesdays and Thursdays and Saturday from 11:00 am till 4:00 pm.